Now a bit better priced! 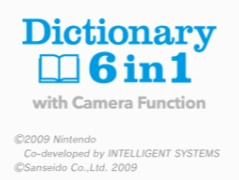 Apparently quickly realising the price was a little too high at 800 points, Nintendo of Europe has already given the DSiWare application Dictionary 6 in 1 with Camera Function, released today, a price drop. When it was released less than a day ago it would've cost you 800 points just to have a very simplistic dictionary to carry with you! Thankfully, it's now a whole 300 points less, meaning you'll only have to pay 500 points for it - a much better deal, we think. Although we have no review for the app yet, we've heard reports that it can only translate the simplest of words - for example, the word lumberjack will not even be recognised! This probably means that if you're looking for something to translate long, complicated sentences with, you should look elsewhere! We'll have our review online soon, so you can see what we think of it. I'd just posted word of this on the forums about 1 minute before this article appeared -- I also found an early review (in German), in case anyone is as curious as I am. Well good to hear it's cheaper. I mean it's not even a real dictionary with that few words. They get 60% of any NES game for free. I'd probably get the first 60% of TMNT, since it's a struggle to make it past that point anyhow. Or I'd gift 60% of Mario 3 to a friend, and laugh when Mario disappears into a void near the end of World 5. It sleeps all night and it sleeps all day. so, do people get the 300 points back? it's hardly a dictionary if words like lumberjack aren't in it.. the camera function looks interesting, might be useful for signs in foreign countries, as long as it can recognize them, heh. And hangs around in bars. I can see them updating it every now an then, but other than that, the dictionary will remain as small as it is. You won't be able to get the full Oxford English Dictionary translated into Japanese, ever. Still, this the price it should've been launched at initially. @WiiGuy. So far I've heard that the few people that bought this have so far received nothing Thanks Nintendo. Wish this had more asian languages or was up to par with the cheapo pocket translators you can get in HK. I guess it's cheaper than even they are though, but it's not really useful for me. I'm interested to see how well the camera integration works. If it's reliable, it'd be worth the 800 points. But I'm speaking from an obviously personal perspective and, overall, I agree that a lower price equals more sales. I'm hoping that's the reason the price was lowered, and not because it's a hunk of crap. I was worried when I read the description stating it knows "thousands of words", for 6 languages that should be tens of thousands or even hundreds. Good job Nintendo! Now it's an better deal! I don't know why you think you should get a refund, If I go to GameStop buy a game for $30, then next week, it goes on sale for $20, I can't get refunded $10. Because it held the price only one day or even less. When Ms dropped the XBox's price from the initial ridiculous 480€ they gave everyone who paid that much an apology package. But this is Nintendo, not Microsoft! True, but they should give the 300 pt refund in some form, like they did for the Internet Browser. So, how is this any different from going to a free translation site (i.e. babelfish, freetranslation.com) on the DSi Browser? The free websites can do whole sentences and most words (well, a gisted translation) and do it to and from 15 or so different languages. This $5 app that some people payed $8 for only does one word at a time, and not many of them, to and from 6 languages. It's a 15.000 word dictionary (according to the "Help" section), so don't expect a great word coverage. Still, as I am learning japanese, I find this dictionary VERY useful, as you can write japanese and chinese characters and find the words you search very quickly. It's well worth 500 points, I would even buy it for 800. You can scan Japanese text into it with the built-in DSi camera, so you do not have to reproduce it by your hand. And that is all, I am afraid (I bought it).